Stranded asset risk has been the primary motivation fueling coal and fossil fuel divestment among private and public sector organizations. On the flip side, investors have poured billions of dollars into the shares of U.S. shale oil and gas producers, fueling a boom in exploration and production that completely reversed the declining trend of national production and vaulted the U.S. to the top of the global oil producers’ league table. Besides low prices, falling output and actions to reduce greenhouse gas (GHG) emissions, these investors face another serious threat: the high levels of debt taken on by shale oil and gas producers. The risk of default is higher among smaller producers as they generally rely on debt to a greater extent than their larger counterparts. National and international legislative and regulatory actions to mitigate and adapt to rapid climate warming, such as the Obama administration’s Clean Power Plan and the UNFCCC’s recently minted climate change treaty, heighten U.S. shale oil and gas producers’ stranded asset risk. Adding to the challenges, shale oil and gas field production is falling faster than initial projections and hedging revenues are falling amidst the persistence of low prices. U.S. shale oil and gas companies continue to tap the debt and equity markets to stay afloat. As the $8.9 billion in Q1 equity investment indicates, investors are apparently ¨throwing caution to the wind¨ and buying newly issued shares, Carbon Tracker highlights in a press release. 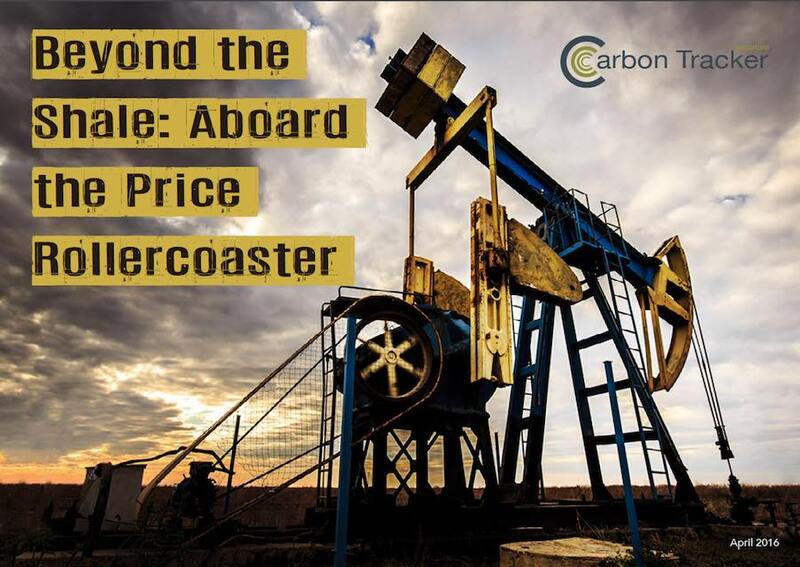 In the report Carbon Tracker analyzes five of the largest “pure play” U.S. shale oil and gas exploration and production companies. The carbon market research and investment company concluded that Chesapeake and Whiting had the highest leverage ratios of the five. Each have debt levels more than 4x their adjusted pre-tax earnings given any reasonable assumption as to oil and gas prices for this year. Banks and other creditors in general consider a 4x debt leverage ratio as an upper limit in assessing the creditworthiness of borrowers. So does the U.S. Comptroller of the Currency when it analyzes bank loans and identifies those that are sub-standard, Carbon Tracker notes. A requirement that management keep debt leverage ratios below 4x is typically included in the covenants governing loan and securities agreements. If transgressed, creditors could demand the borrowed money be repaid immediately. Creditors have agreed to suspend debt leverage requirements included in Chesapeake and Whiting’s cases, deciding they could wait for oil and gas prices to rebound, which, if prices rise sufficiently, would bring the producers’ leverage ratios back below four. Chesapeake, moreover, has had to secure its previously unsecured credit line by pledging to turn oil and gas properties over to the banks. This development puts Chesapeake’s assets on the line, “illustrating the risk of wider impacts once covenant limits are reached,” the report authors point out. Banks and investors, as well as shale oil and gas producers, have been waiting a long time for prices to rebound. Across the sector, total outstanding bond and loan borrowing stood at $353 billion. More than 1/3 is rated below investment grade, aka ¨junk¨ debt. In fact, at 8 percent ot a nationwide total $1.6 trillion, U.S. shale oil and gas E&P companies account for more junk debt than those making up any other sector of the economy, Carbon Trackers adds. The risks of default and investor losses are stark. A loss of investor confidence in 2015 brought asset values down and led to large losses of wealth. Market capitalization for U.S. shale oil and gas E&P companies dropped $340 billion from May 2015 to March 2016, according to the report. Bondholders have seen the value of their investments drop by $76 billion during the past eight months. Looking ahead, Carbon Tracker’s projections see 2016 revenues for the group of five producers falling 20 percent on average year-over-year. Hedging revenues are projected to come in 62 percent lower on average. That’s assuming oil and gas prices trend higher from those experienced in Q1. “The oil price rout has punished companies which failed to look ahead and hedge production. Those who set off at a sprint at the start of a marathon are feeling the pain now. Investors will have to be more careful than ever about betting on who will finish first, and indeed if they will cross the line at all,” said Gerard Wynn an advisor to Carbon Tracker and co-author of the report. Given the opportunity, climate deniers and those who oppose phasing out fossil fuel dependence latch on to news of a renewable energy company filing for bankruptcy to spuriously assert that wind, solar and other emissions-free energy resources aren’t viable. News that Sun Edison – the largest developer of solar power projects in the U.S. – is preparing to file bankruptcy is the latest example. Besides inaccurately – as well as misleadingly – identifying solar PV’ as a fundamentally flawed mainstream source of electrical power, critics of climate change action and renewable energy conveniently omit mentioning the numerous bankruptcies that routinely occur amidst the ups and downs of the oil and gas market and industry. Investors and society at large would be much better served by more closely examining the vagaries, costs, risks and threats the speculative, “boom and bust” nature of the oil and gas industry, as well as the losses that have been borne by investors as the long list of defaults and bankruptcies continues to lengthen.